And of course there are the love letters and the miscellaneous items I’ve thrown into a box for St. Vinny’s – but the latter definitely doesn’t count until they’re in the hands of the saint himself, or at least at his nearest retail outlet. This is a lovely Schwinn frame that has not been stored in a dry, covered space. 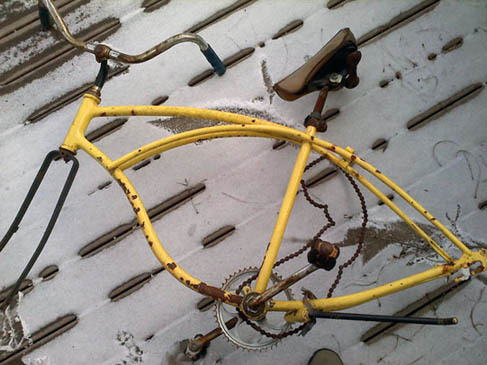 Although fork, cranks and handlebars are attached, they are rusty beyond hope. The previous owner did a not-so-great paint job that is peeling off and leaving rust spots on the frame. However, it’s a gorgeous frame and can be revived with proper care. (See photos.) A professional powder-coat paint job would run $100-$200 and would allow the bike to be stored outdoors most of the year; a good spraypaint job would take at least a couple weeks (to allow for drying time and sanding between coats)and the bike would need to be stored in a dry and covered area if you don’t want to have to respray it every year. The rest of the parts could be picked up cheaply. Despite my tear-jerker of an essay, the guy who picked it up was not planning to restore it, but to use it in an art project. Oh, well. I guess art is cool, too.